Editor’s note: Hot Property is contributing real estate writer Robyn A. Friedman’s ongoing report on South Florida’s residential real estate market. VIDEO: Pompano Beach Mayor Lamar Fisher addresses the crowd with developer Danny Salvatore, a principal of Fernbrook Florida LLLP, before a topping off ceremony Thursday (8/17) at Sabbia Beach in Pompano Beach. About 150 guests, including the development team, brokers, unit buyers and local government officials, gathered at the sales gallery of Sabbia Beach today (Aug. 17) to commemorate the topping off of the 68-unit project, under construction at 730 N. Ocean Blvd. in Pompano Beach. In the construction industry, “topping off” (sometimes referred to as “topping out”) signifies when the last beam is added to a structure. Builders consider it a construction milestone, as well as a media event. Up north, developers plant an evergreen tree on the top floor of a building. Here, a palm tree is generally added to the top story. Guests at the Sabbia Beach event were treated to mimosas, hors d’oeuvres and bagels and lox while a steel drummer played Marley and more. 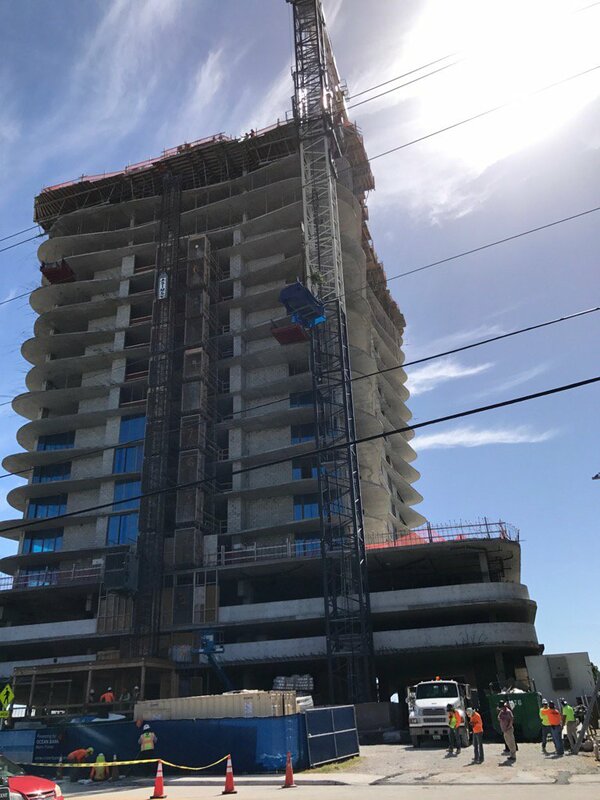 Developer Danny Salvatore, a principal of Fernbrook Florida LLLP, and Pompano Beach Mayor Lamar Fisher addressed the crowd before everyone stepped outside to watch a crane hoist the palm tree, and an American flag, to the top of the 19-story building. “This is our first venture, and we’re excited about it,” Salvatore told City & Shore, adding he’s “looking at” doing two or three more projects, one in Pompano Beach and the others also in Broward County. He said one would be a rental and another, for sale. Fisher thanked the developer for investing in Pompano Beach and for his commitment to the city. “It is a game-changer for us,” he said. Sabbia Beach is over 85 percent sold out, with about half of the buyers coming from the northeast and Canada; and half, locals who are selling homes in the suburbs to live at the beach. Remaining units are priced at $950,000 to more than $2 million. Completion is expected in the spring of 2018. Amenities include a port-cochère entrance, oceanfront pool deck, fitness center, spa and 3,600-square-foot social room with bar, catering kitchen, game and poker tables and large-screen television. For information about Sabbia Beach, call 954-781-9700 or visit sabbiabeachcondos.com. Posted Aug. 17, 2017 (Photo: A crane hoists a palm tree, and an American flag, to the top of the 19-story Sabbia Beach project). About 100 Douglas Elliman real estate agents from Jupiter to Miami gathered April 26 to celebrate the grand opening of the new sales gallery for Four Seasons Private Residences Fort Lauderdale. The sleek 3,500-square-foot gallery, which overlooks the site where the Four Seasons will rise, is located on the ground floor of the adjacent Hilton Fort Lauderdale Beach Resort, at 505 N. Fort Lauderdale Beach Blvd. Its focal point: a scale model of the 90-unit Four Seasons project, under development by Miami-based Fort Partners. Douglas Elliman, which is handling sales and marketing for the project, relocated the sales office to the ground floor from a 5,000-square-foot penthouse unit on the 25th floor of the Hilton. That space has a model kitchen and bathroom for potential buyers to experience. The developer started sales on March 1, and 25 percent of the units are under contract, Teixeira says. The project is attracting New Yorkers and international buyers who enjoy easy access to Fort Lauderdale by air. The 22-story Four Seasons, at 525 N. Fort Lauderdale Beach Blvd., was designed by architect Kobi Karp and will feature 42 “Private Residences,” which will be delivered designer-ready; and 48 furnished “Four Seasons Residences,” private residences that owners can put into a hotel rental pool. Those units, designed by Tara Bernerd, will be delivered “toothbrush ready,” Teixeira says. Units range from one to four bedrooms. Current pricing ranges from $2 million to $15 million. Teixeira says that construction should commence this summer, with completion expected 24 months later. For more information about the Four Seasons Private Residences Fort Lauderdale, call 954-363-0000 or visit fort525residences.com. About 100 people — brokers, unit purchasers, development executives and local government officials —attended the groundbreaking last week of 100 Las Olas in downtown Fort Lauderdale. The mixed-use project, by West Palm Beach-based The Kolter Group, features 121 residences, 8,500 square feet of retail space and a Hyatt Centric Hotel with 238 guest rooms. The building, which will be 499 feet high and have 46 levels, will be the tallest building in Fort Lauderdale. Speakers at the groundbreaking included Vail; Michael Neal, president and CEO of KAST Construction; James Hansen, Jr., vice president of Kolter Hospitality; Peggy Fucci, CEO of OneWorld Properties and Mayor Jack Seiler. Residential units at 100 Las Olas, which will occupy levels 16 through 46 of the building, will range from 1,501 to 2,964 square feet. Prices start at $800,000. Amenities include a resort-style pool, cabanas, fitness center, news lounge with daily beverage service and a clubroom with catering kitchen and bar. Expected delivery is the fall of 2019. The Hyatt Centric hotel will occupy levels nine through 15 and will feature event space, a pool and fitness center. It’s scheduled to open in 2020. For information on 100 Las Olas, call 954-800-6263 or visit onehundredlasolas.com. About 200 invited guests, including the development team, brokers, unit buyers and local government officials, attended a sunset celebration last week (Feb. 23) to commemorate the topping off of Riva, a 100-unit luxury condominium under construction at 1180 N. Federal Highway in Fort Lauderdale. In the construction industry, a “topping off” party is traditionally held when the last beam is added to the structure. Builders consider it a construction milestone – as well as a media event. Guests were treated to cocktails and hors d’oeuvres while a violinist played lively music to entertain the crowd. Those who dared were able to ride the construction elevator to the 15thstory of the building — which still lacks walls – to check out the views. Riva is located across from George English Park on a two-acre waterfront site on the Middle River. The 15-story condominium is about 70 percent sold out, says its developer, Bradley Deckelbaum, of Premier Developers. The project features two- and three-bedroom units as well as penthouses and an 8,788-square-foot “river loft” with four bedrooms and four and one-half baths. Amenities include a private club for residents, fitness center, clubroom, an exhibition kitchen, private wine lockers, a pool, cabanas, spa and a dog walk. Designed by Fort Lauderdale-based FSMY Architects and Planners, Riva is the first luxury condominium along the Middle River. Premier broke ground in June 2015 and expects to complete the project this summer. Current pricing ranges from just under $800,000 to $5.5 million, Deckelbaum says. About half of the buyers are locals, he added, with the remainder coming from the Northeast and Midwest. For information about Riva, call 954-233-3288 or visit riva-condo.com. Posted Feb. 27, 2017. Above photo: The 15-story Riva, the first luxury condominium on the Middle River in Fort Lauderdale, is about 70 percent sold out. Morton Group Inc., a Boca Raton-based development firm, has launched sales at The Metropolitan, a 48-unit condominium project at 33 SE Third Ave. in Delray Beach. Pricing for the units ranges from $450,000 to $1.2 million. The project is expected to be completed in October 2018. For more information, call 917-657-2840 or visit sodelray.com. / Posted March 24, 2017. Photo: Lord Richard Best, an independent member of the House of Lords of UK’s Parliament; and Stuart Shield, founder of the International Property Awards; present Joseph Kavana with the award. 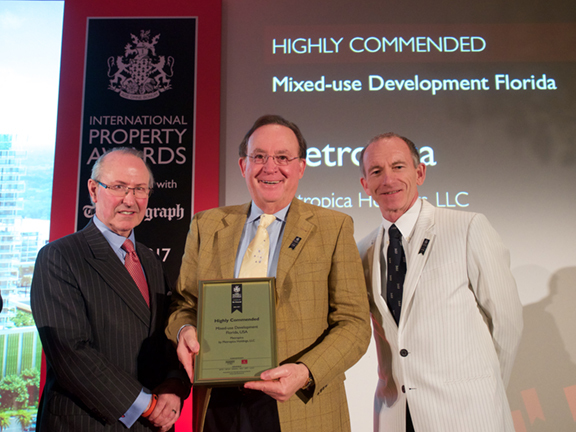 Sunrise-based Metropica Holdings LLC, developer of the eponymous 65-acre master planned development in Sunrise, has received an award at the International Property Awards in London for its Metropica project. The International Property Awards, held on Dec. 11, recognize achievement by companies operating in all sectors of the property and real estate industry and are split into regions. 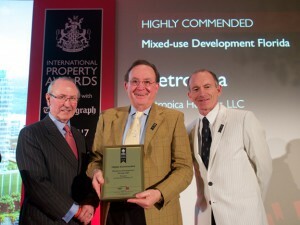 Metropica won for the Americas region and was recognized as “highly commended” as a mixed-use development in Florida. The first tower at Metropica, a 28-story building named YOO, is expected to be completed in the fourth quarter of 2018. It will have 263 units ranging in size from one to three bedrooms. Prices range from $397,500 to $689,000 for traditional condominium units and from $1,152,000 to $1,306,000 for three-bedroom, two-story penthouses. The project will ultimately have a total of eight residential towers, with 2,250 units, as well as retail and restaurant space, 650,000 square feet of office space, a hotel, fitness facility and beach club. Over 200 invited guests — real estate agents, developers, condominium buyers and governmental officials — attended a panel discussion at The Addison in Boca Raton Wednesday (11/2). The subject: The state of the South Florida real estate market. The event was sponsored by real estate brokerage Douglas Elliman and Penn-Florida Cos., the developer of Via Mizner, a mixed-use project in Boca Raton that includes luxury apartments, retail space, a Mandarin Oriental hotel and a branded condominium project called The Residences at Mandarin Oriental Boca Raton. Senada Adzem, executive director of luxury sales at Douglas Elliman. Susan Haynie, mayor of Boca Raton. Jonathan Miller, president and CEO of Miller Samuel, a real estate appraisal and consulting firm. Jay Parker, chief executive officer of Douglas Elliman’s Florida brokerage. Haynie began by discussing Boca’s strong job growth and how the city is working to attract new businesses. Boca Raton offers good schools and medical care, she said, as well as a wealth of cultural opportunities, making it attractive to both businesses and their employees. Parker said people from the Northeast continue to show interest in living in South Florida, whether on a full-time or part-time basis. But many people want to avoid the density and traffic congestion of cities like Fort Lauderdale or Miami, and that’s creating demand for housing in Boca Raton. New Yorkers in particular are attracted to South Florida, Parker said, because they can save on taxes by becoming a Florida resident, since the state has no income tax. Parker said that the savings could range between 8 percent and 13 percent for New Yorkers who relocate. Adzem noted that her clients, particularly those from foreign countries, are seeking safety and security in addition to a “resort lifestyle.” She also said that buyers in Boca Raton are younger today than they were 10 years ago. In the past, people would look into purchasing in Boca if they were nearing retirement or already retired. That’s no longer the case, she said. In fact, Adzem said, the average age of a member at the Boca Raton Resort & Club is currently 48; 10 years ago it was 68. Douglas Elliman also distributed its third quarter 2016 market report on Boca Raton at the event. According to the report, the Boca housing market continued to see rising prices in the third quarter. The median sales price for both single-family homes and condominiums moved higher, with condo median sales prices rising 9.5 percent year-over-year, to $196,000, and the median price of a single-family home rising 5.7 percent year-over-year to $414,950. Sales of single-family homes increased by 11.9 percent in the third quarter, with 750 sales closing. Condo sales slipped, however, by 3.9 percent year-over-year, to 743 transactions. Still, condo sales were up 32 percent over the second quarter of 2016, when 563 condos closed. Miami-based Newgard Development Group has officially broken ground on the Gale Residences Fort Lauderdale Beach. 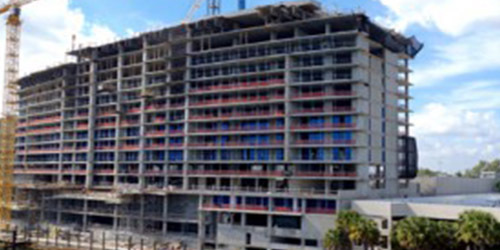 About 75 people attended the grounding-breaking ceremony Wednesday (8/17) at the future site of the condominium project, at 401 Bayshore Drive in Fort Lauderdale. The attendees included local government officials, real estate agents, buyers and members of the development team. The 12-story Gale Residences Fort Lauderdale Beach features 129 one-, two- and three-bedroom condominiums ranging from 800 to 2,100 square feet. Current prices start in the $500,000s. Earlier this month, Newgard, which is building the project in collaboration with Merrimac Ventures, obtained a $35.6 million construction loan from Dallas-based Hall Structured Finance. Demolition and site work for the Gale Residences actually began in April. Sales at the Gale Residences began in March 2015, and 70 percent of the units are sold, Hernandez says. Construction is expected to take about 18 months. For more information about the Gale Residences Fort Lauderdale, call 954-888-2841 or visit galefll.com. Over one hundred governmental officials, real estate professionals and other guests attended the grand opening of the sales center for The Reserve at Edgewood on June 22. The townhouse development, located at 2807 SW 15th Ave. in Fort Lauderdale, is under development by Aventura-based Brick O. Real Estate, founded in 2010 by Daniel Avakian. The Reserve features 105 two- and three-bedroom units ranging from 1,110 to 1,500 square feet and priced from $330,000. The two-story units include private terraces, granite countertops, GE appliances, hurricane-impact windows and doors and walk-in closets. Community amenities include a pool, clubhouse, fitness center, community dog park and playground. Among those attending the grand opening and ribbon-cutting were Avakian, Fort Lauderdale Mayor Jack Seiler, City Manager Lee Feldman, Assistant City Manager Christopher Lagerbloom, Fire Chief Robert Hoecherl, Fort Lauderdale Commissioner Romney Rogers and Fort Lauderdale Chamber of Commerce President Dan Lindblade. Construction of The Reserve at Edgewood is expected to commence this summer, with groundbreaking on the first phase of the townhouses scheduled for the fall. For more information, call 954-526-4663 or visit TheReserveatEdgewood.com. The mayor, vice mayor and the entire city commission of the City of Wilton Manors gathered last night (June 14) for the official ribbon-cutting of the 179-unit Metropolitan apartments. The $35 million development, built on the site of a blighted mobile home park at 1220 NE 24th St., was constructed by Ascend Wilton 24th Street LLC, an affiliate of Boca Raton-based Ascend Properties, comprised of developers Dean Borg, Richard Finkelstein and Michael Wohl. The project includes studios and one-, two- and three-bedroom units ranging from 627 to 1,359 square feet. Units include open kitchens with granite countertops and stainless steel appliances, spacious bathrooms, upgraded flooring and fiber-optic wiring. Community amenities include a resort-style pool and hot tub, clubhouse with outdoor kitchen and barbecue area, fitness center, yoga studio, massage room, private garages, trash valet, boardroom, cyber café, dog park, herb garden and charging station for electric cars. Rents range from $1,395 to $3,200, Borg says. Ascend also created an art park, with benches, a fountain, shade trees and a sculpture, on the northeast corner of the property and dedicated it to the City of Wilton Manors for use as a community park. Borg said about 65 leases are signed to date, with everything from young professionals to active retirees moving in. The first residents took occupancy on May 15. Next up for Ascend Properties: A condominium project in Palm Beach Gardens and apartments in the Blue Lagoon Office Park in Miami. The developers of Auberge Beach Residences & Spa in Fort Lauderdale announced last week that a penthouse unit at the project has gone under contract for a record price per square foot for a pre-construction condominium. actually set a record last month when a 5,800-square-foot penthouse in Auberge’s south tower went under contract for $8.9 million. That unit will have a private plunge pool, four bedrooms, six baths, a den and a private sunroom with a 270-degree view of Fort Lauderdale and the beach. The sale last week was for a 4,292-square-foot unit with four bedrooms, five and one-half baths, a 4,100-square-foot terrace and private pool. The contract price was for slightly over $7 million, which calculates to a price of $1,632 per square foot. The previous record per square foot was for a unit sold in 2015 at The Ritz-Carlton Residences in Fort Lauderdale. It’s important to note that there’s a difference between a unit that goes under contract and a unit that has sold. The record-setting units at Auberge are under contract but have not closed yet. The unit at The Ritz-Carlton closed in April 2015. “The highest price per square foot is a truly closed deal,” says Dan Teixeira, senior director of luxury sales at Douglas Elliman Real Estate in Fort Lauderdale. Is a “micro-mansion” the luxury trend of the future? Real estate developer Frank McKinney Thursday (3/31) unveiled his latest concept in high-end speculative real estate: the micro-mansion, a 4,042-square-foot, ultra-luxury home he’s currently building in Ocean Ridge. The two-story house, at 19 Tropical Drive, is on a quarter-acre site located 345 feet from the beach. While 4,000 square feet might not seem “micro” to many buyers, it may be to McKinney’s target market — ultra-high-net-worth individuals accustomed to living in 10,000-square-foot oceanfront mansions. He feels there’s a gap in the market for affluent purchasers who want to downsize to a smaller, more manageable but still luxurious property — who don’t want to move into a condominium. The micro-mansion, slated for completion by the end of the year, will have an ultra-modern design with unique amenities such as a sun deck floating between two pools, antique wood flooring from a sunken 16th century Spanish galleon, sea-glass kitchen counter tops and a master bedroom suite with a second-floor outdoor shower that has trees growing into it. McKinney said that the sea-glass countertops alone would cost him $128,000. The price for all this luxury: McKinney doesn’t know yet. He said he would set a price when the house is closer to completion, but that it would likely fall in the $4 million to $10 million range. About 150 guests attended the grand opening Monday (3/7) of Douglas Elliman Real Estate’s newest office, located on the ground floor of The Ritz-Carlton Fort Lauderdale, at 1 N. Fort Lauderdale Beach Blvd. Several Elliman leaders — Howard M. Lorber, chairman; Dottie Herman, president and CEO; Nicole Oge, global chief marketing officer; and Gus Rubio, chief operating officer, Florida — attended. Fort Lauderdale Mayor Jack Seiler, who led the ribbon-cutting ceremony, welcomed Douglas Elliman’s second official office to the city. Guests were offered cocktails, hors d’oeuvres and a jewelry trunk show by Tom Ford and watch show by Michael Kors, both presented by Memories jewelry boutique, before the ribbon-cutting ceremony. The 1,730-square-foot Ritz-Carlton office will be led by the team from Realty Marketing International (RMI), which was acquired by Elliman last year. RMI was the original exclusive agent for The Ritz-Carlton Fort Lauderdale and has completed sales of over 40 luxury condominium developments in Broward and Palm Beach Counties. “About 40 percent of the buyers in our new developments and the Ritz-Carlton are from the Northeast, so we wanted to connect with a very strong company in New York,” says Dan Teixeira, formerly with RMI and now director of luxury sales for Douglas Elliman in Fort Lauderdale. Douglas Elliman has more than 80 offices in the greater New York City area and a network of over 6,000 agents, as well as a significant presence in South Florida, Beverly Hills, Connecticut and Aspen. The firm also has a strategic international alliance with London-based Knight Frank Residential. PHOTO: From the left: Gus Rubio, Douglas Elliman Chief Operating Officer, Florida Brokerage; Dean J. Trantalis, City of Fort Lauderdale Commissioner; Nicole Oge, Global Chief Marketing Officer at Douglas Elliman; Midge Clark, Douglas Elliman RMI Team; Howard M. Lorber, Chairman at Douglas Elliman; Fort Lauderdale Mayor Jack Seiler, Dan Teixeira, Douglas Elliman RMI Team; Dottie Herman, President & CEO at Douglas Elliman; and Patty Robinson, Douglas Ellliman RMI Team. Construction is officially underway at Auberge Beach Residences & Spa Fort Lauderdale, which held a groundbreaking ceremony on Dec. 14. Representatives of the development team, local government officials, real estate agents and buyers of units at the luxury project attended the event. Football legend Dan Marino, who purchased a condominium, was there as well and participated in the ceremonial first dig. Broward County Commissioner Chip LaMarca and Fort Lauderdale City Commissioner Bruce G. Roberts also attended the groundbreaking ceremony. Other notable guests included Carlos Rosso, president of the Condominium Division at The Related Group; Edgardo Defortuna, founder and president of Fortune International Group; Andy Mitchell, CEO of The Fairwinds Group; Kathy Mitchell of The Fairwinds Group; Matt Allen, COO of The Related Group; and Patrick Campbell, Vice President of The Related Group. Over 300 people gathered at the Metropica sales gallery in Sunrise to attend the groundbreaking ceremony for YOO, the first of eight residential condominium towers that will rise at the 65-acre, mixed-use development. Guests were offered a glass of champagne upon arrival and then moved from the sales office to the construction site, where they heard from developers Joseph Kavana and Scott Leventhal of The Trillist Cos., Inc., as well as Michael J. Ryan, the mayor of Sunrise; Erick Collazo, vice president of Metropica Holdings LLC; Jennifer O’Flannery Anderson, Ph.D., vice president for advancement and community relations of Nova Southeastern University; Bob Swindell, president and CEO of the Greater Fort Lauderdale Alliance; architect Chad Oppenheim and broker Daniel de la Vega of ONE Sotheby’s International Realty. Kavana announced that sales at YOO — which he described as being in the “epicenter of South Florida” – are nearing 50 percent. Metropica, designed to be an urban center in a suburban area, will ultimately include 2,250 residences as well as shopping, restaurants, a fitness center, beach club, 650,000 square feet of office space and hotels. When completed in 2017, YOO, located at 1800 NW 136th Ave., will have 28 stories and 263 units. Prices currently start in the $300,000s for the one-, two- and three-bedroom units and in the $900,000s for the penthouses. For more information, call 954-526-8432 or visit livemetropica.com. Posted Oct. 29. Over 200 guests attended the grand opening Wednesday (Oct. 7) of the 2,500-square-foot sales office at Sabbia Beach, a 68-unit oceanfront condominium at 730 N. Ocean Blvd. in Pompano Beach. The guests included Pompano Beach Mayor Lamar Fisher, City Commissioners Barry Dockswell and Barry Moss, real estate agents and others who joined Danny Salvatore and Federico Fernandez of Fernbrook Florida LLLP, the development firm, and the project’s sales team, for the opening. The evening began with a cocktail reception and tour of the sales office, which includes a model kitchen and master bath. The kitchen included a chef’s island, Italian cabinetry, stone countertops and Miele and Sub-Zero appliances. The model master bath featured Toto fixtures, a glass shower, stone countertops and a freestanding soaking tub — which was filled with champagne bottles. After the tour, guests entered an adjacent tent for hors d’oeuvres and desserts and were entertained by live jazz music. A gourmet coffee bar later awaited guests at the valet stand. Designed by Arquitectonica, Sabbia Beach will break ground in the first quarter of next year. Completion is scheduled for the end of 2017. Prices for the two-, three- and four-bedroom units range from the $900,000s to $3.5 million. Penthouses start at $5 million. Contact: 954-781-9700, sabbiabeachcondos.com. Posted Oct. 9, 2015. Encore Housing Opportunity Fund and Daniel Kodsi, the developers of Paramount Fort Lauderdale Beach, report that over 60 percent of the 95 units are under contract. Under development at the site of the former Howard Johnson Hotel at 701 N. Atlantic Blvd. in Fort Lauderdale, the 18-story building will feature two-, three- and four-bedroom units priced from $1.2 million, as well as multiple pools, cabanas, a gym and ground-floor restaurant. Completion is expected in the winter of 2016. Posted June 9. According to BBX Capital Real Estate, a division of BBX Capital Corp., and New Urban Communities, models will be open and ready for viewing at The Village at Victoria Park by September. Located in Victoria Park in Fort Lauderdale, the gated community consists of 30 two-story homes with three or four bedrooms and private courtyards. Prices start at $659,990. Posted June 9. Three generations of principals from Premier Developers — Moe, Gordon and Bradley Deckelbaum — were present in Fort Lauderdale on June 1 for the official groundbreaking of Riva, a 100-unit luxury condominium at 1180 N. Federal Highway. The developers were joined by Fort Lauderdale Mayor John P. “Jack” Seiler, City Commissioners Dean Trantalis and Robert McKinzie, members of Moss & Associates and FSMY Architects, Index Investment Group, new residents and representatives from ONE Sotheby’s International Realty for the commencement of construction of the 15-story building. The project is scheduled for completion in the fall of 2016. Posted June 9.